It’s no secret that, as we get older, things that we used to do easily become more difficult. If you or a loved one are finding activities of day to day life a little challenging, you may have begun to think about what options for help are available. Many seniors have family members who are willing to provide some assistance, but they may not be able to offer everything that’s needed. If this is the case with you or your loved one, home care services may be the answer. Consequently, The Davis Community has recently added a new option to its array of services: a premium home care service called Concierge Care. Are you afraid Mom might not remember to take all of her medication? Do you worry that Dad may not be eating as well as he should? Do you ever feel guilty that you can’t be there to help as much as you’d like with cleaning or chores around the house? Above all, Concierge Care can put your mind at ease! A professional caregiver can check in with your loved one, provide needed services and reminders, and give you the peace of mind of knowing that he or she is being well cared for. Loneliness can contribute to physical and mental health issues, and seniors are especially at risk for feelings of isolation. According to one recent survey, more than 40% of seniors experience loneliness on a regular basis. Concierge care provides physical services such as housekeeping or meal preparation, but it can also be a much-needed source of companionship. As a result, it’s common for seniors and caregivers to bond, forming relationships that enhance their lives. 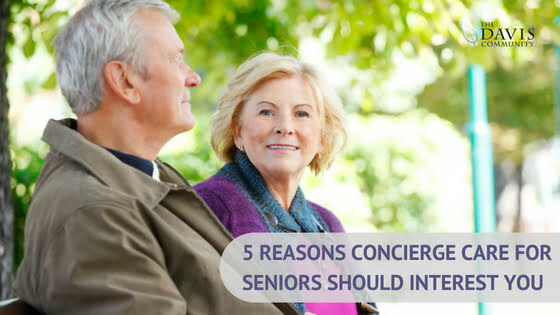 Many seniors look forward to their appointments as a chance to visit and connect. If your loved one doesn’t need extensive help around the home, Concierge Care can still provide opportunities for companionship or social outings that will contribute to their health and happiness. Concierge Care isn’t a one-size-fits-all package. It’s up to you and your loved one to determine which services are necessary. We then design a customized home care package to be tailored to their needs and schedule. However, should their circumstances change down the road, services can be added or discontinued as needed. Many seniors find themselves in a position where they may not need all of the care offered by assisted living or residential care facilities. Likewise, they aren’t quite able to remain at home without assistance. Some of them may have family nearby who can fill in the gap. However, some families live too far away, or their schedules don’t allow them to provide all of the needed assistance. This is where home care services come in. The services offered by Concierge care contribute to senior safety and independence. This can make it possible for seniors to age in place, avoiding or delaying the need to leave the home they know and love. Even if you live close enough to provide your loved one with assistance, delivering the care they need could easily become your primary focus when you see them. Wouldn’t you rather spend your time together visiting, chatting, and enjoying each other’s company? By taking care of some of the more time-consuming tasks for your loved one, Concierge Care will free up your time to just be together, to go on lunch dates, to play games, listen to music, or do anything else that you enjoy. This entry was posted in Concierge Care, Senior Tips. Bookmark the permalink.